President-elect Donald Trump said in a tweet Thursday that the Pentagon's costly new F-35 Joint Strike Fighter could be replaced with a modified version of a less expensive plane, the F/A-18 Super Hornet. The F-35 is made by Lockheed Martin (LMT), while the Super Hornet is made by aerospace rival Boeing (BA). Trump's tweet was the latest in a series of episodes where he has taken a hands-on approach to government procurement. It also comes a day after a meeting with the chief executives of Boeing and Lockheed Martin. The F-35 is the Pentagon's largest single program and is estimated to cost $400 billion to procure the nation's next generation fighter fleet. For Lockheed, the F-35 is its industrial future. Trump's tweet has threatened to upend Lockheed's plans just as his tweets aimed at China has rattled Boeing, which is counting on selling jets to Chinese airlines. Through 2016, 285 F-35s had been purchased for three U.S. military branches, including 36 for the U.S. Navy. But the Navy is already considering the purchase of 10 to 15 additional Super Hornets annually through 2020 because of delays getting the F-35C model used on aircraft carriers. Boeing's F/A-18 Super Hornet on the left, and Lockheed Martin's F-35 Joint Strike Fighter on the right. Boeing, which has continuously updated the Super Hornet with new electronics, bigger fuel tanks and new stealthy features, has pitched the Navy jet as a more affordable alternative to the F-35. Only the Navy operates the Super Hornet. The Department of Defense's plans call for purchasing 2,158 more F-35s by 2038 for an estimated $265 billion, according to the nonpartisan Congressional Budget Office. The F-35 with its advanced sensors and stealth capabilities has gone years and billions of dollars over budget, though its corporate and military leaders have said the worst is behind them. The Pentagon's F-35 program leader said earlier this week that more than $500 million would be needed to complete the advanced jet's development. Much of the F-35's future affordability is based on the sheer number being purchased by the U.S. and its allies. Any move to scale back the purchase, Lockheed and the Pentagon say, makes it harder to bring down the cost of each jet. Lockheed Martin's stock dipped about 2 % in aftermarket trading. A spokesman for Lockheed Martin declined to comment Thursday, but on Wednesday Lockheed chief executive Marillyn Hewson said after her meeting with Trump, "I appreciated the opportunity to discuss the importance of the F-35 program and the progress we've made in bringing the costs down." Boeing tweeted that it is "ready to work" with the Trump administration. Ready to work with @realDonaldTrump's administration to affordably meet U.S. military requirements. The budget office estimated on December 8 that if the Defense Department curtailed plans to add more F-35s and instead buy more Boeing Super Hornets and F-16s, also manufactured by Lockheed, taxpayers would save an estimated $29 billion. 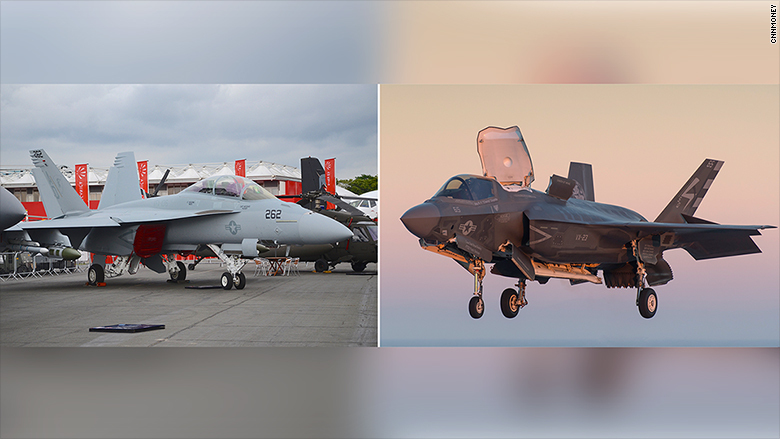 The Canadian government abandoned plans to purchase F-35s in favor of Boeing Super Hornets to replace their aging CF-18 jets. 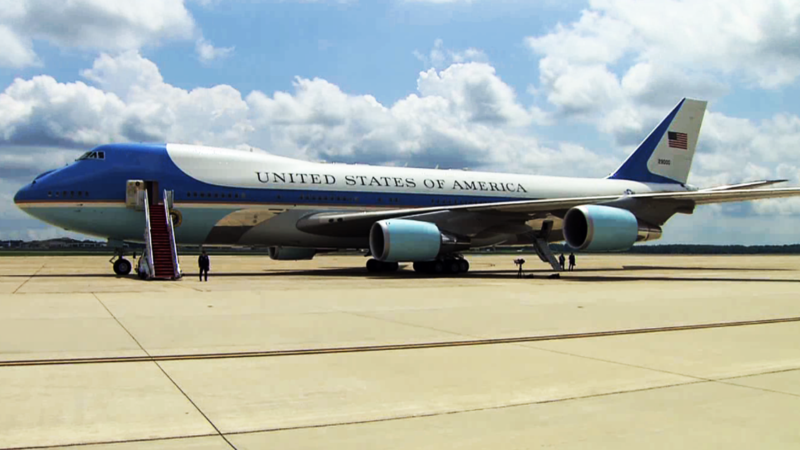 The president-elect started putting aerospace giants in the crosshairs after a December 6 threat to cancel a Boeing contract to build two new jets to serve as Air Force One over concerns the development was having severe cost overruns. Trump claimed, without offering evidence, that the price of the planes was more than $4 billion and "out of control." Pentagon estimates have laid out a budget of $2.9 billion for the two heavily-modified airliners. Boeing chief executive Dennis Muilenburg on Wednesday vowed to deliver the new presidential transports for under the president-elect's $4 billion figure.